When you attend our annual Evening en Blanc you're making a difference in the lives of low income, underinsured and uninsured patients, while enjoying a chic picnic with friends. This special fundraising event is held annually in August at a surprise location. 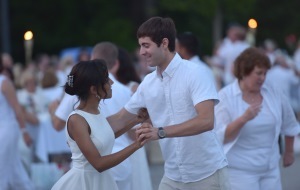 This year's Evening en Blanc is August 17, 2019. Your registration fee or charitable gift to this event supports primary, behavioral and dental health care at Concord Hospital Family Health Centers in Concord and Hillsboro-Deering. Interested in the event but don't want to plan a picnic? Food will be available on site. We will announce our menu as we get closer to the event. Join us on Facebook ~ Like and follow Concord Hospital's Facebook page to receive the latest information about this event. Comment, like and share our posts with your Facebook network and help us reach others with our mission. When you become an event sponsor your company’s brand is exposed to 250+ cause-orientated community members attending the event. Call (603) 227-7162 to invest in Evening en Blanc sponsorship opportunities. To meet your specific sponsorship investment goals, you can choose from sponsorship levels ranging from $100 to $10,000, all the while helping to support primary, behavioral and dental health care of our neighbors in need.